Link has been a favorite since the original Super Smash Bros., and he still shines today. Although his jumps lack in comparison to Toon Link's, his attacks are much more powerful. His down smash is good for a quick attack to both sides, in case you are surrounded. The upward smash is great for dealing damage, creating combinations, and KO-ing opponents because it hits three times and the final strike has a lot of knockback. His sideways smashes have a nice reach, and if you press the attack button again (you can vary your timing to be tricky), he will do a second, more powerful slice than the first one. 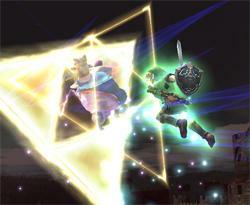 In addition, link's midair down attack is very powerful, dealing heavy damage with awesome diagonal knock back. Try using a short jump and go straight into the attack, this makes it hard for the opponent to dodge it. Careful, though, as Link is very vulnerable if this attack misses. Link is a heavyweight who struggles when it comes to throwing opponents. However, his projectiles give him fantastic edge-guarding capabilities and his final smash is almost a one-hit KO. His speed isn't too bad, not too fast and not too slow and despite being in the lower tier for attack power, his attacks give him better offence than expected. He can deal a good amount of damage and he'll last a little while too. Link's Arrows are very fast and can go a long distance when charged. While they may not do as much damage as his bombs or have the aiming capabilities of the Boomerang, the Arrow's advantage is their incredible range, which can be used to strike opponents from the other edge of the stage. If you have Link attempt to pull out an arrow and push backwards on the control stick RIGHT AFTER (Just long enough so Link doesn't throw the Boomerang) he will charge his arrow while facing the opposite direction. Very helpful when being chased, and many characters can do this with their own standing Specials as well. The boomerang is one of link's best projectiles in a one-on-one match, this is not due to the damage it causes, but the effects the boomerang has. On its way back, it draws players closer to you, allowing you to hit them with a smash attack but it's primary use is in edge-guarding strategies. By learning the distance the boomerang moves you can accurately push opponents back because at the end of the boomerang's path, it pushes enemies back without hurting them. This could be useful when the opponent is trying to recover as you can push them back, making it harder for them. You can use this strategy after curving the boomerang as well to make it easier for you to push the opponents back. His Boomerang can also blow many of the items off of a stage with good aim. Helpful when you really don't want certain items to be lying around. Bombs are useful in both one-on-one and free-for-all matches, in one-on-one matches, throw the bomb so that it will explode straight away if the opponent catches it. If the opponent is out of reach throw the bomb in mid-air to give it some extra distance. Against a reflector using character, throw the bomb so that it lands just in front of the character, as the enemy can reflect the bomb, but not the explosion. In a free-for-all, throw bombs into groups of enemies to deal a lot of damage to a lot of people. You could also throw it off the edge of a cliff as an edge-guarding tactic as it would be hard for the enemy to dodge if you aimed the bomb well. Also, if you air-dodge while holding a Bomb and push the 'Standard Attack' button you will drop the Bomb directly below Link. While it may not differ much from just throwing it downward, you can do this very close to an opponent thanks to the air-dodge. Their is a trick some people employ with Link that is very difficult to pull off but can greatly improve his recovery. What you do is hold a bomb before you get launched off the stage and do his Spin attack like usual, but IF the bomb blows up in your hands after the Spin Attack you will be able to attack again, allowing for another Spin Attack or Clawshot. Link is infamous for his terrible recovery, as his second and "third" jumps are very short. Try throwing the boomerang or air-dodging and then using the clawshot to grab the ledge if the opponent tries to prevent you from returning to the stage. Avoid Spin Attacking on the ground, however, as it leaves you vulnerable to attacks and takes a long time to execute in comparison to other attacks. There is a combo that lets Link use the Spin Attack more effectively, just do the first two swings of his standard combo and instead of doing the third slash, activate the Spin Attack to send the foe flying. This lets Link 'trap' the foe with his first two hits so that he can't run from the Spin Attack. He uses his master sword for many melee attacks. Basic Swordplay Slashes twice then stabs forward. The first hits is a normal swing and knockback the enemy a little but the second hit get him back to Link. You can try to cancel the last hit with another attack like a smash or Up-Special. + + + + Axe Slash Brings his sword down like an axe. A little slow but a good Ko-ing move, even better than forward smashes. This attack is exactly the opposite the dash attack: this is slow at the beginning but relatively safe at the end, deal good damages and good knockback. Since its pretty hard to differenciate Link's slow running from his dash, it may be a unpredictable attack. + + + + Arch Slash He slashes his sword above him in an arch. Good for juggling foe, its may be a better attack to send him flying than the upper-smash. + + + + Low Slash He slashes while crouching. Smash + + + (Smash + ) or (Smash + ) or Double Blade He slashes forward with his sword. Press A again for a second, more powerful attack. If did well, this is the best attack to cancel the third hit of Link normal combo. Smash + + + (Smash + ) or (Smash + ) or Triple Slash He slashes upwards three times. The first two don't have much knockback, the third does. This isn't a good kill move but its 17% damages and DACUS make a good choice for cac. Smash + + + (Smash + ) or (Smash + ) or Duo Swing He slashes on both sides, low to the ground. It is the easiest attack for cancelling the third hit of the normal combo. Its a fast and good killing move. Link grabs opponents with his clawshot. This move is laggy if it missed, so only use it if you are confident it won't miss. after grab after grab after grab after grab Hilt Bash Link bashes opponents with the hilt of his sword. after grab after grab after grab after grab Kick Out Link lets go of his opponent then kicks him. after grab after grab after grab after grab Kick Back Throws his opponents back and kicks him. after grab after grab after grab after grab Upwards Slash Throws opponents up then slashes them. after grab after grab after grab after grab Touch Down Link violently lands on his opponent. Interestingly, Jigglypuff is too light for the first of this move and will only get hit by the second hit. Drop Kick Link kicks. The kick gradually gets weaker. At first view it look weak but its much more powerfull. First the hit box is very wide (take Link full body + his extented foot) combined with Link quickfall (down while in air) it creates a speed, almost undodgeable if foe isn't aware below him, good attack. Second it does not have any cooldown at all (except falling coldown, which can be easily cancelled) so it lets you do almost any attack for a combo, so its a good move. It may be used to trap your opponents when they are below you (like when they dodging toward you). + + + + Sword Spin Spins around while slashing with his sword. + + + + Double Rear Kick Link kicks backwards two times. Like a lot of back-air, its a very quick attack and a god killing move but very hard to land. + + + + Upwards Thrust Link thrusts his sword upwards. Use it when you are at your maximum jump speed so it will trap your enemy. + + + + Ending Blow Link thrusts his sword down. Despite what you may think, do not spam this move. People are going to predict it and will easily avoid it, then hit you while you're vulnerable. Its a great killing move but the hit box is ridiculously small. It is an obsolete move compared to the neutral-air. or or Clawshot Link uses his clawshot as an air attack. Interestingly this attack is the only move of the game that can take you out of the air dodge. Hero's Bow The longer you charge it, the farther the arrow flies. + + + + Gale Boomerang Tilt up or down on the control stick/pad to determine the flight path of the boomerang. It also creates a small whirlwind to draw enemies closer. When the boomerang is coming back to Link, it draw hard the foe so Link can dodge it to let the foe fly away from him. Also, when the foe is trying to recovery you can lunch it against a wall (or you can jump out of the stage and use the edge of it) so it quickly come back Link then he dodge and it draw the foe out of the stage, cancelling their recovery. + + + + . Spin Attack You can charge this attack on the ground to a certain extent. It's also useful for recoveries in the air. Knocks enemies away with the ground attack, but keeps them in for a multi-hit with the air attack, with the last hit knocking the enemy away. This move on the ground is good for KO-ing, so it's best to save it for that. When a is trying to stop your recovery by jumping on you and attacking, you can prematurely start this move so your opponent is trapped in the aerial spin attack. + + + + Bomb He pulls out a little bomb. This counts as a held item, so if you already have an item in hand, you can't use this move. This is basically just a bob-omb, but with less damage and much less knockback. If you hold the attack button while Link cannot throw is bomb (like while dodging), he won't throw it even if he can at the end of the move. If your are still holding the button and tilt your c-stick to use a smash (only on gamecube pad), Link will smash your opponent instead of throwing the bomb, making a mindgame move. Twirls his sword twice and sheaths it, like he does in Twilight Princess. + ( or )+ or or Set free a fairy, who twirls around you. 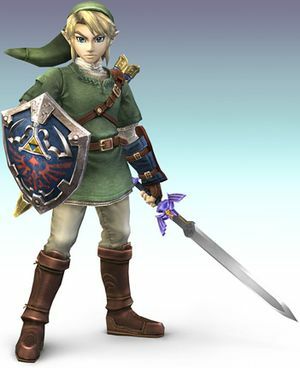 + Stands on one foot and poses, like his taunt in the original Super Smash Bros.
Triforce Slash: Link creates two giant Triforce symbols that trap a character while Link slashes them repeatedly, and finally hits them with a powerful blow to knock them off the stage. Two or three characters can be trapped by lining them up before activating the Triforce slash, if you're careful and lucky enough. Link's final smash, is best activated when an opponent is in the air, as this makes it hard for them to dodge it. If the opportunity arises, however, don't be afraid to activate it on the ground. This final smash can be very useful in killing multiple opponents as other enemies can get caught in the attack if they are grouped together. Use this to your advantage in free for alls and team battles so that you can make the most of the final smash. The range of it is slightly longer than Link's Master Sword. It can also pull in foes positioned slightly above Link, too. If needed, use the Clawshot grab move to get foes in closer. Also note that Link's Final Smash can be cancelled in certain landscapes. If the target is behind a diagonal pass-through wall and Link is on the side that's solid, his Final Smash will stop before getting off a single strike. Be careful of this when on Custom Stages. This page was last edited on 27 July 2018, at 21:27. This page has been accessed 76,142 times.